As you've probably definitely been able to tell, my life is revolving around the Olympics now. Because of my excitement, I challenged myself to a week's worth of AMERICA outfits! I did it, though! Well, 6 days worth. Sunday was spent in the ocean, so... my 'Merica suit was on, and that's about it. 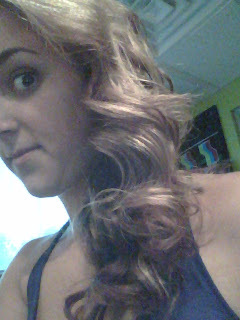 I apologize in advance for the awful quality of the pics. I need a fancydancy camera for posts like these, but homegirl is poor. White lace tank from Ross [$4], red shorts from Forever21 [I think $10 last year? 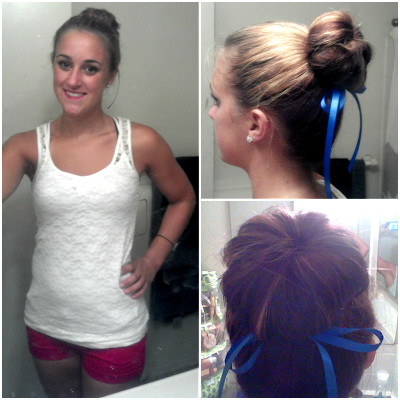 ], sock bun with blue ribbon, white sandals. 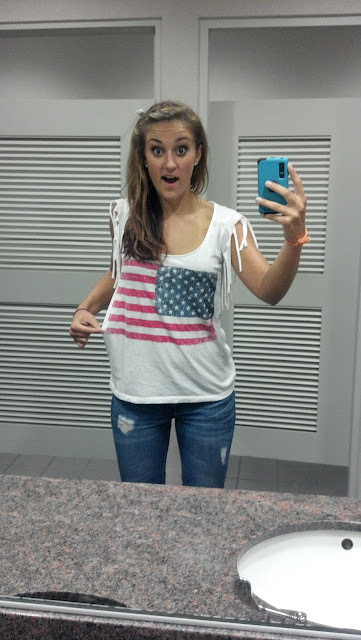 My "trashy 'Merica shirt" from Forever21 [$10], ripped jeans from Charlotte Russe [$20], white Keds sneaks that you can't see. Blue racerback-lace tank [wish I had taken a picture of the back! from Forever 21 clearance- $6], white jeans from Wet Seal [$15], red and cork heels from Rue21 clearance [$4], $1 red earrings from some cheapo store in the mall, and curly hair! My friends were in town from NoVA, so it was obviously a special occasion. Simple and comfortable day- Blue dress from Forever 21 [$8], red polka dot flats from Wet Seal [$1] and an old white necklace. I had an event at Ocean Breeze Waterpark, so I went with a pretty see-through linen shirt from Old Navy clearance [$10], jean skirt from Forever21 [$10], and red, white and blue bathing suit top from Wal-Mart [$12]. Chambray tank from Kohl's I think [~$15], red shorts from Forever21 [$10], white sandals from GoJane.com [$8]. They're not the most extravagant or full-of-effort outfits, but I'm not mad about them! Plus, for EVERYTHING I wore, it was a total of less than $150! Not bad for a week's worth of getting dressed, eh? I should challenge myself to themed fashion weeks more often. It actually makes picking out clothes easier and helps me feel like less of a slob.